Speed is a major factor in overall road safety performance. Excessive and inappropriate speed is accountable for about one third of fatal collisions and is an aggravating factor in most collisions. 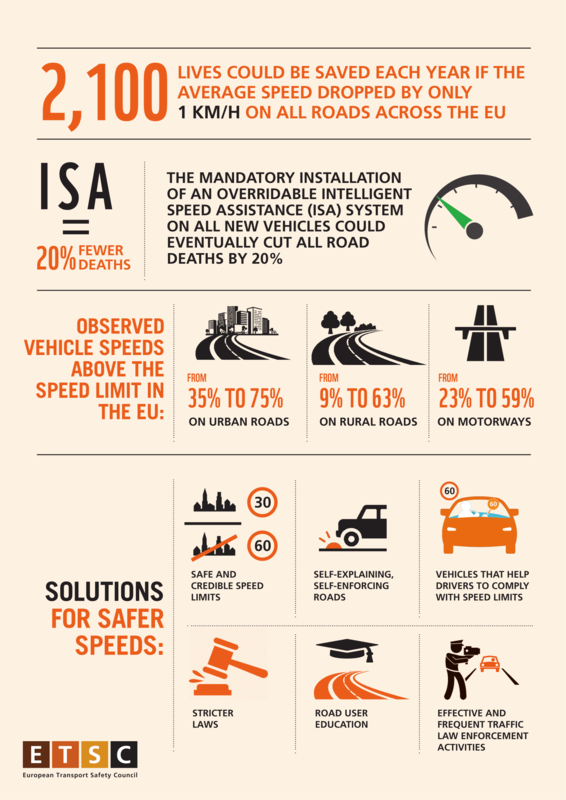 2,100 lives could be saved each year if the average speed dropped by only 1 km/h on all roads across the EU. In the EU, 37% of all road deaths occur on urban roads. Among the countries that monitor levels of speed compliance on urban roads countrywide, between 35% and 75% of vehicle speed observations are higher than the legal speed. There has been a mixed progress in reducing mean speeds on urban roads in countries that could provide data. 55% of all road deaths in the EU occur on rural non-motorway roads. There has been an overall lack of progress in reducing mean speeds on rural roads in the countries that could provide data. Standard speed limits on rural non-motorway roads vary across EU Member States. Most of the countries with a significantly lower road mortality rate than the EU average of 50 deaths per million inhabitants apply a 70 km/h or 80 standard speed limit on rural roads. Among the countries monitoring speed on rural non-motorway roads, between 9% to 63% of vehicle speed observations are higher than the speed limit. On average, 8% of all road deaths in the EU occur on motorways. In countries providing data concerning speeds on motorways, progress in terms of annual change in average speed on motorways is mixed. Between 23% and 59% of observed vehicle speeds on motorways are higher than the speed limit. The Safe System approach, which has been endorsed in the EU strategic action plan on road safety, requires the road traffic management system to limit speeds to survivable levels, taking into account that humans make mistakes and their bodies have a limited tolerance for kinetic forces in case of a road collision. Experience shows there is not one single measure to reduce speeds for all road types. Member States and the EU institutions should prioritise a range of integrated measures that together bring road users to safe speeds. These measures include safe and credible speed limits supported by self-explaining and self-enforcing roads, vehicles that help drivers to comply with speed limits, stricter laws, effective traffic law enforcement activities and road user education. Member States should also develop performance indicator targets for desirable levels of speed compliance and systematically monitor the progress towards these targets. Speed limit selection is a critical indicator determining safe travel speeds for different road types. Which speed is considered safe depends on the road design and its function, traffic volume, the composition of traffic and potential conflict types. Some countries have adopted national guidelines accompanying road traffic acts to help speed limit-setting authorities adjust speed limits. It is hard to know the extent to which these guidelines are implemented as most of them are not binding. Moreover, speed limit reviews are usually not mandatory. Implementation of those national guidelines could be improved by financial or other incentives. A combination of mobile roadside police checks together with automated stationary enforcement, including fixed and average speed or time-over-distance cameras has proved to be an effective tool in addressing speeding. 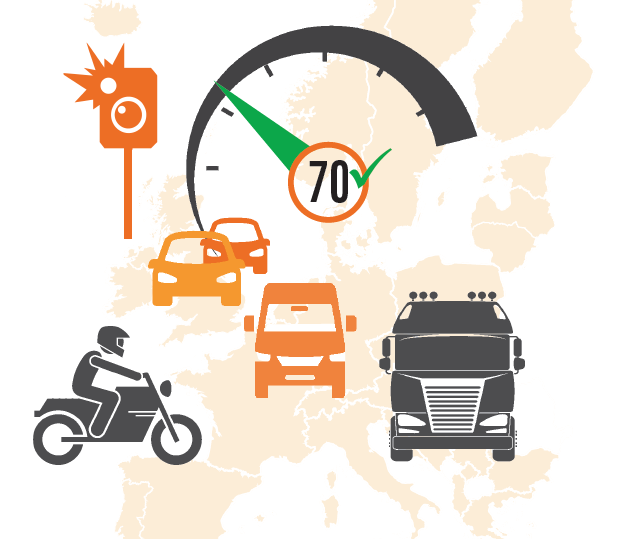 In general, there appears to be an overall increase in speed offences detected throughout the EU, mainly due to the extension of safety camera networks. Nevertheless, there are big discrepancies regarding the amount of safety cameras and the number of speeding tickets issued in each Member State. Out of the 27 countries that could provide data on the number of speeding tickets issued over the period 2010-2017, the figure went up in 18 countries while 9 registered a decrease. The EU’s Third Mobility Package, a set of policies and legislative initiatives designed to make a major contribution to cutting road deaths and serious injuries in half by 2030, is currently working its way through the legislative process. The EU has the exclusive authority to set minimum safety standards for all new vehicles sold on the EU market. The standards were last updated in 2009. The package includes a legislative update to minimum vehicle safety standards. The proposed standards include mandatory fitment of overridable Intelligent Speed Assistance (ISA) on all cars, vans, buses and heavy goods vehicles. Research shows that this single technology could help to achieve a high level of compliance with speed limits and eventually cut road deaths by 20%. Regularly and systematically collected safety performance indicator (SPI) data can contribute to effective speed management strategies. The EU’s Third Mobility Package contains a Strategic Action Plan on Road Safety that suggested putting forward key safety performance indicators (SPIs) in the EU road safety policy framework 2021-2030. Some of the indicators that are currently being discussed will focus on driving speeds. If implemented by the Member States, this European Commission initiative will allow monitoring Member States’ progress in improving various road safety areas and will enable better understanding of the reasons behind the progress or lack of it. The package also contains a proposal to update road infrastructure safety management rules. The existing Directive only covers the major European motorways and other roads that form the Trans-European Road Network (TEN-T). The proposal envisages extending the scope of the Directive beyond the TEN-T network to motorways and primary roads, as well as all roads outside urban areas that are built using EU funds. It could improve transparency and introduce a proactive approach to assess collision and severity risk, with clear links to speed management.